My first trail marathon is in the bag! And what a fun day it was. 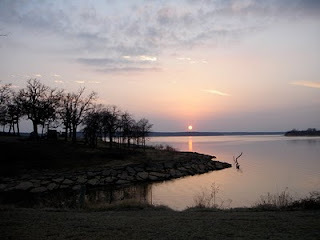 Nancy and Melissa picked me up at 4:00 am and we headed south to Lake Texoma for the 30th anniversary of the oldest trail race in Texas. After 2.5 hours of driving we arrived at Juniper Point and picked up our packets. There was a great long sleeved tech shirt this year. YAY! Love tech shirts vs. the cheap cotton shirts. We had a few minutes to get our numbers on and socialize before the marathon race started. I was VERY nervous. 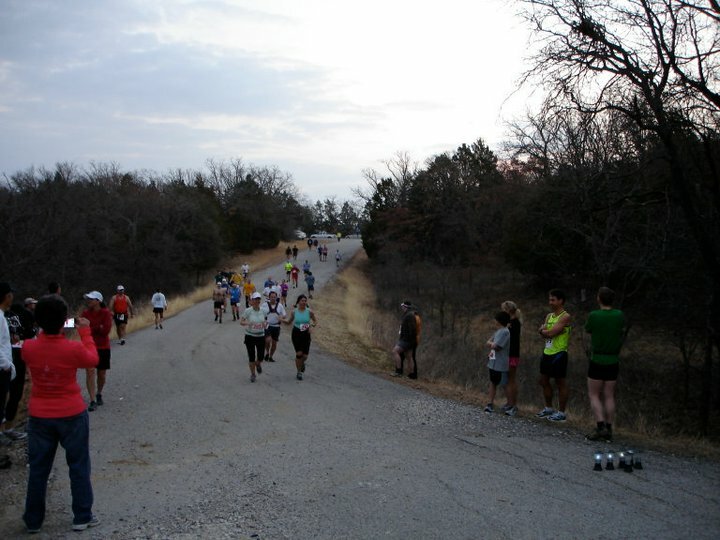 I know how tough this trail is from running the half marathon last year and this would be my first full marathon. So I have a VERY healthy respect...for the trail and for the distance. I started out with Melissa and we ran together for a mile or so before she disappeared up the trail. I settled in with Henry Bickerstaff and a nice runner visiting from Ohio named Nate. It was warm and humid so I was taking S! caps every 45 minutes and drinking lots of water and Gatorade. It's absolutely true that some of the hills on this course are so steep you have to reach for things to grab onto to pull yourself up. 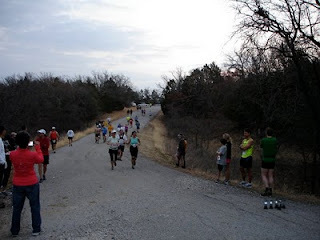 I could feel my heart pounding in my chest so hard after getting up some of those hills. Tough! We made it to the Stairway to Heaven aid station and I got to see Larry. Wow...what an aid station! There was so much food it was hard to even decide which thing I wanted to try next! We headed out of there and I took a handful of gummy bears with me to eat on the trail. Took my first fall just a few minutes out of this aid station, ironically on a completely flat and non-technical portion of the trail. ; ) No injuries, jumped right back up and started running although my gummies did get a bit dirty, darnit. (I ate them anyway.) Once you get past Stairway to Heaven, the trail evens out a lot and becomes much easier. I tried to make some good time on the flatter trails and got some good running in here. I had an absolutely wonderful day and enjoyed every second of the race. The organization and volunteers are so wonderful and Teresa puts on a top notch race. I have a couple of large blisters, one blood blister and am very sore today. Yep, doing the post marathon shuffle. I love this race and will have this on my schedule every year. Wow, congratulations Julie! You certainly don't mess around. Sounds like a really tough first marathon! What's next for you? That's why I will probably never do a road marathon...no gummy bears! (or oreos, or pb&j sandwiches, or m&ms, or potato chips) It's no wonder I usually gain a pound at trail races! Very nice job Julie. Congratulations on finishing your first marathon, and a trail one at that. Look forward to running with you soon. Congrats on a first trail marathon. You're absolutely right about road marathons not having all the goodies that trail ultras offer. My next goal is a trail marathon! I found my love of trail running last year and can't wait for the weather to clear up so I can get back on them. What a great report! So inspiring! Glad I found your blog. All the best with your first ultra. Enjoy every moment out there.